Colemans Solicitors of Haywards Heath are our 2018 Golden Solicitor! 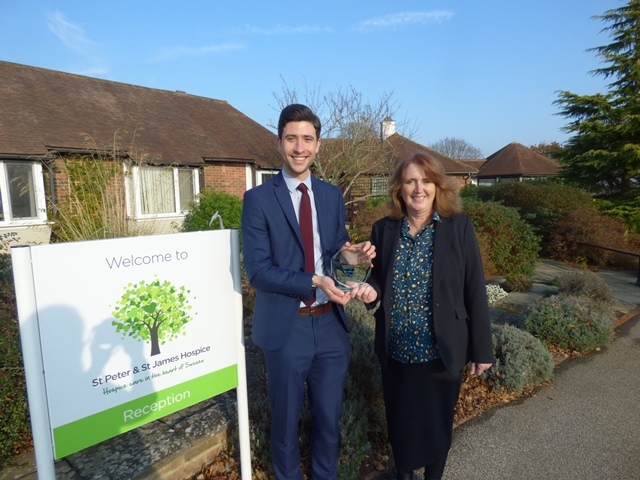 We’ve presented our annual Golden Solicitor Award to Colemans Solicitors, Haywards Heath, in recognition of the amount they raised for the hospice during our Make a Will Month in 2018. The scheme raised a fantastic £12,735, with Colemans Solicitors celebrating the highest branch total at £2,280. Thank you to all participating solicitors and thank you to everyone who donated to either create or update their Will as part of the scheme, and to everyone who has generously left a gift to the hospice in their Will; one in four of our patients is cared for through these legacies. Make a Will Month 2019 takes place from 1st – 30th April and suggested donations are £120 for a Single Will or £180 for a Joint Will. For a full list of participating solicitors please leave your name, email address or telephone number here, so we can get back to you as soon as we have a full list of participating solicitors. During Make a Will Month, local solicitors generously agree to offer a limited number of Will-writing appointments free of charge. Instead of paying the solicitor for professional advice, customers are asked to donate to St Peter & St James Hospice, with some also choosing to leave a gift to the hospice in their Will. Mulcare Jenkins, Rohan Solicitors, Waugh & Co, Griffith Smith Farrington Web LLP Solicitors, Lawson Lewis Blakers, Stevens Son & Pope, Adams & Remers Solicitors, Astburys Solicitors, Chrismas Ogden, Bennett Oakley Solicitors and Colemans Solicitors.